The title of today's entry was uttered by the South West Trains (SWT) guard as he checked mine and m'colleague's tickets as we headed south-west from London aboard the 1035 Class 444 'Desiro' train to Weymouth. And those fond of SWT's 3CIGs will also, by now, have guessed our intended destination. For Saturday 22 May was the final day's service for these 1963 stalwart electric multiple units (EMUs). Designated as Class 421 mid-way through their introduction, they are probably best known by those perhaps less enthusiastic of the railways as the 'slam-door electric trains that ran into London from the south'. Built between 1964-72 at British Rail's (BR's) York factory, the trains, known as 4CIGs initially, ran exclusively on the Brighton Main Line, linking the route's southern-most terminus with London. They were also later to be seen running to/from Portsmouth. Their original title - 4CIG - derives from the manner in which British Rail's Southern Region named its traction types. 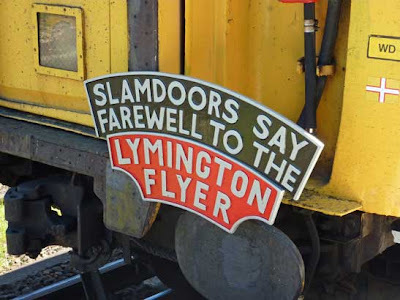 In the case of the slam-door EMUs, 4 referred to the number of units/carriages and CIG stood for "Corridor BrIGhton Stock". 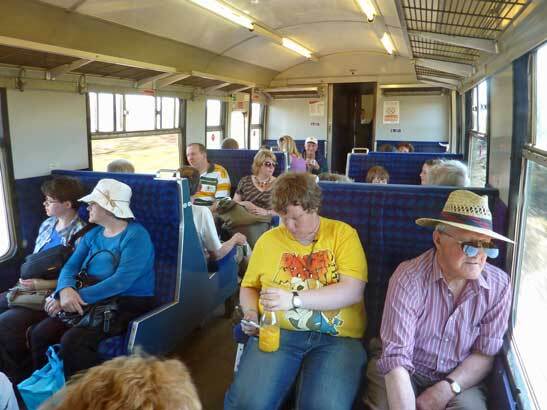 This type of train, however, eventually became synonymous with commuters in the south of England. Privatisation and the influx of newer trains with electronically controlled plug doors eventually sealed their fate. 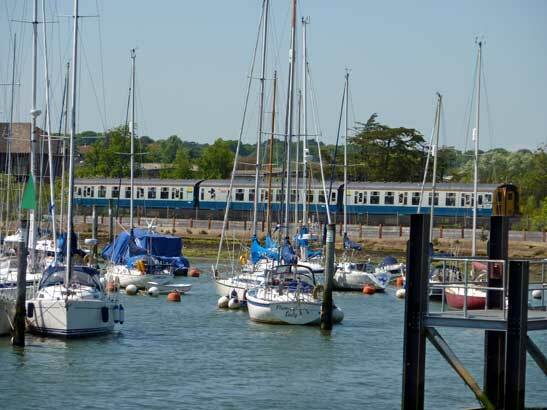 During 2005, a decision was taken to remove all slam-door electrics from passenger service in the UK, though SWT received a special dispensation for their 5.25-mile Lymington Branch, linking the main London Waterloo-Weymouth line at Brockenhurst with the idyllic marina town of Lymington. The branch line's existence relies heavily on the ferry service between Lymington and Yarmouth on the Isle of Wight, and to this extent, the small town boasts two train stations: Lymington Town and Lymington Pier. 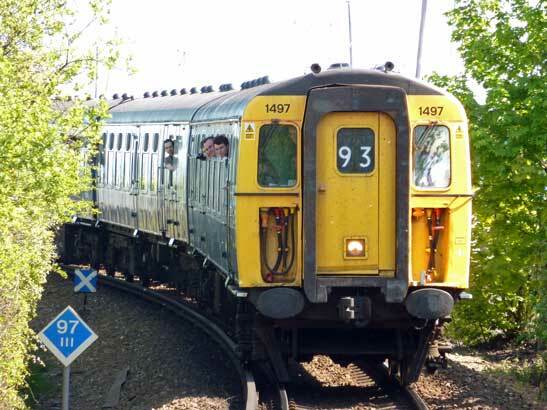 M'colleague and I first travelled on the line soon after its outreach from the 2005 Class 421 cull had taken into effect. We were mid-way through our 2005 LEYTR Railrover jaunt and travelled north from Lymington Pier to Brockenhurst thence to Pokesdown. 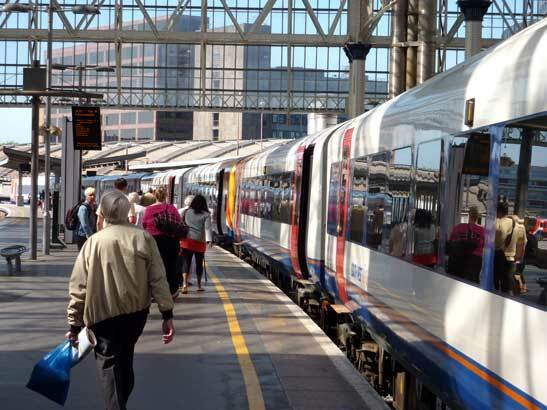 On Saturday, almost five years on, the traction type's reign here was at an end: SWT have now withdrawn both specially-converted EMUs and have started operating Class 158 diesel multiple units (DMUs) along the branch on weekdays and '450' EMUs at weekends. Many will undoubtedly knock SWT for their withdrawal - especially along a fully-electrified branch line when they're to be replaced by DMUs - but travelling on the trains revealed how tired and worn they are now looking. As we both arrived at Brockenhurst, off an immaculate SWT Desiro, we were lucky enough to see both units in action - 1498 'Farringford' had worked all journeys up until its arrival into Brockenhurst at 1224 and 1497 'Freshwater' would then take over for the remainder of the day. While both trains - named after two vessels that sailed for many, many years between Lymington and Yarmouth - are still officially Class 421s, they're now referred to as 3CIGs on account of both units losing a carriage when they were removed from main line service and prepared for their retirement along the Lymington Branch. Both now comprise three carriages - one of which being First Class compartments - another being Standard Class seating and the central one being part-Standard Class, the guard's compartment and an area housing wheelchair users and parents with buggies. Both trains have worn heritage liveries since they were saved from the scrap yard. 1497 'Freshwater' carries BR's blue and grey livery, while sister 1498 'Farringford' wears BR's all-green livery. You might assume the timetable would reflect the relaxed operation these two 3CIGs were clearly undertaking. Actually, they increased their daily exercise considerably since being allocated here. While they don't exceed 60mph at any point along the 10.5-mile round trip, they are expected to undertake a tireless 10-min drive, 5-min turnaround for over 16 hours (0559-2224). In fact, the operation is so intensive, SWT had to overcome problems it identified with running DMUs with such fast turnarounds. Despite the 3CIGs now having gone for good, the new '158' DMUs appear to require additional running time - 1 minute in either direction. It says much about both the diesel engine over electric motors and new over old that a vehicle less than two decades old requires extra time to cover the same distance a vehicle more than twice its age could manage. You could, therefore, quite rightly ask SWT for the reason why it decided the withdraw the trains. They cited the necessity for another complete overhaul, both mechanically and internally and the level of cost this would levy, as the prime reason. As we mentioned, both trains weren't in the best of states and while we understand they could have continued running for another year or so, a decision was taken - be it for better or worse - and D-Day was on Saturday. Some of the design features that have been lost with modern trains were in evidence on Saturday as we both made numerous trips along the line. Firstly, door width is something that has become a lot more generous over the years. The end Standard Class carriage has three doors - one at either end and one in the middle - all of which are incredibly narrow by today's standards and the central one features passengers sat opposite each other as you board. While this was always the case, the ambiance afforded the new generation of EMU and DMU has seen passenger seating well away from the much wider entrance doors. We both jumped aboard Freshwater's second journey of the day, departing Brockenhurst at 1259, and I soon cottoned on to the fact that in order to take photos and video, we really needed to board as late as possible and immediately close the door behind. The sliding window could then be lowered for photography. 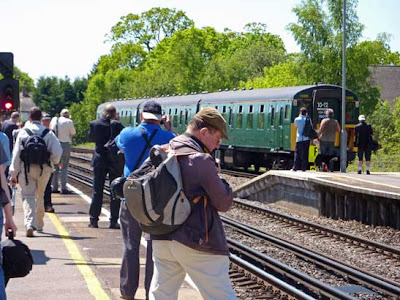 Normally, the loadings along the branch aren't anything to write home about, but today saw a plethora of photographers and families using the line, in addition to tourists heading to/from the Isle of Wight. 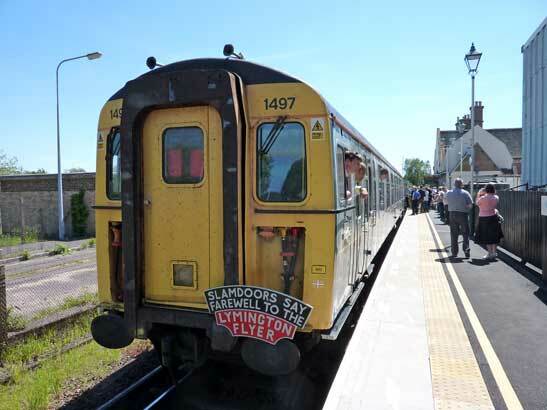 SWT had laid on activities at Brockenhurst station and so too at Lymington Town. Within a mile after leaving Brockenhurst, the line branches off the main Waterloo-Weymouth route and becomes single-track. We head through the southern reach of the New Forest and this is the stretch that sees the trains running at their fastest. We clocked ours, using a GPS device, touching 60mph. Braking for Lymington Town and a number of curves brings up another aspect of modern-vs-old train operation: the burning smell of the air brakes. This was accompanied with the familiar grinding noise, in direct correlation between the driver pulling his lever and the brakes grinding against the wheels. Today, everything is operated electronically and you seldom find a train that allows you to stick your head out the window while in motion. After 4.75 miles, we arrived at Lymington Town. The platform looked almost new and this was due to the work required in readiness for the DMU operation. 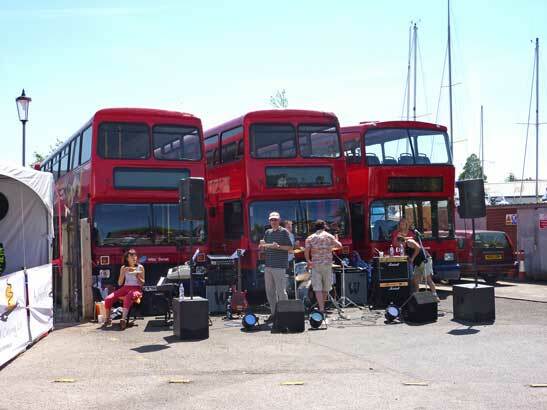 As we exited, we saw a selection of awnings in the station car park with a live band playing in front of the Wilts & Dorset bus depot. Food was on offer (though not as cheap as that being sold in Tesco in the town) and the weather was exceptional - 27C and blue sky as far as the eye could see. We wandered into the town centre where there was a market in full flow along one of the main streets. A number of Wilts & Dorset vehicles passed us, from East Lancs-bodied Volvos to Optare Solos. Having taken brief refuge from the temperature in a cafe that served reasonably-priced milkshakes, we headed back to town and caught the 1416 train north, back to Brockenhurst. At the terminus we stayed on and sat in the familiar BR seating for the return trip. It was very hot indeed and judging by those aboard, around 80% of travellers today were here to say goodbye to the traction type. Once again we left Brockenhurst, passing 'Farringford' that had been stabled along the Up sidings, and south to Lymington. On this occasion we stayed on to the Pier station terminus. The drivers were constantly asking photographers if there was a special number they'd like displaying on the two-roller number blind. Unless a specific request was made, either 91 or 97 was displayed. SWT had a number of staff at all three stations, ensuring everything went off smoothly. They all seemed happy to converse with the enthusiasts and one nice gent told me that both 3CIGs would be coupled together at the end of the day and sent off to the depot at Bournemouth. This would have made an excellent and very rare shot, since usually only one EMU is used on any one day. Back at Lymington Pier, our 30 minutes was utilised by witnessing the Wight Link car ferry from Yarmouth arriving, disembarking and then heading back across the Solent. 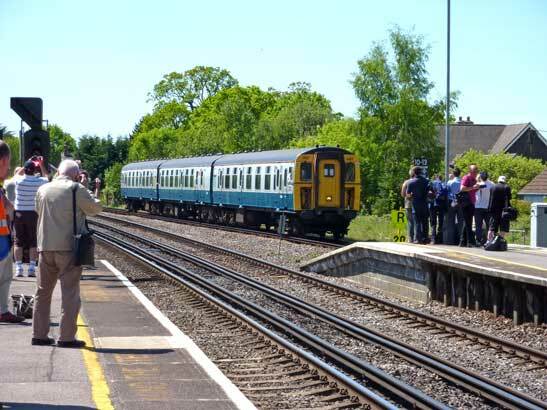 Trains depart Brockenhurst at xx29 xx59 past each hour, arriving Lymington Town at xx07 xx37 and Lymington Pier at xx09 xx39. They return from Lymington Pier at xx44 xx14, Lymington Town xx46 xx16 and arrive Brockenhurst at xx54 xx24. The first train is 0559 ex Brockenhurst and the last is 2214 ex Lymington Pier - that's 32 round trips per day. We caught the 1514 from Lymington Pier the half-mile to the Town and hopped off. The weather was very hot indeed and while we knew the '444' back to London would be air conditioned, still felt the urge to stock up with supplies. We jumped on the service 30 minutes later back to Brockenhurst and then onto our punctual 5-car 'Desiro' at 1615 to Waterloo. But what now for the two '421' 3CIGs that were retired on Saturday? One consideration was that both EMUs would pass to Knights Rail Services of Eastleigh, where they'd join a 4CIG being prepared for mainline service. However, the proprietor sold his 4CIG recently to the Brighton Belle Project for them to use as spares for their 4CIG, which they're fundraising for to enable it to once again return to the main line. It may be that Freshwater and/or Farringford could be returned to their 4-car formation and continue in service, albeit in a wholly preserved fashion.